The two manual organ with 40 divided ranks of Jordi Bosch is a real gem among the Mallorcan organs. Its monumental and splendidly decorated facade (by Fra Albert Borguny) resembles the imperial pomposity of the time and adds to the brilliant sound of its stops. 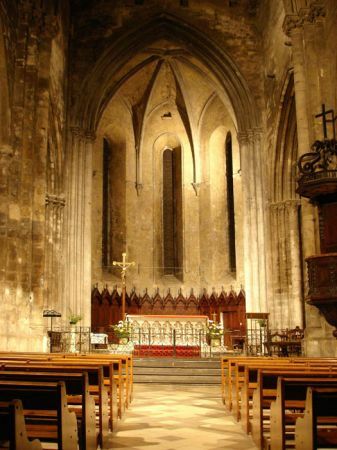 The organ of Santanyi is one of the best preserved works of Jordi Bosch. It has a rich "Trompeteria" composed of 9 ranks of horizontal trumpets, so typical for the Iberian organbuilding school. It spreads its sound to every corner of the church thanks to the fan-shaped (radial) spacing of the trumpets: Baixon faces the east, the Trompa magna the west. The Trompa reial occupies the central position of the Trompeteria. Above the head of the organist there are two ranks of horizontally positioned reed stops with short resonators: Regalies and Dolcaina. The Grand Orgue is built on a wide 16 feet Principal (Flautat maior) which gives sonorous and warm sound to the pleno. The organ preserves the largest existing mixture (Ple) in the world, composed of 25 ranks and 1.104 pipes! It is built on a separate windchest and each tone is fed by its own 2.5 m long wind conduit. One of the special features of the instrument is its great Cornet (10 ranks) which was built "elevated" on a special windchest to give a "better sound". 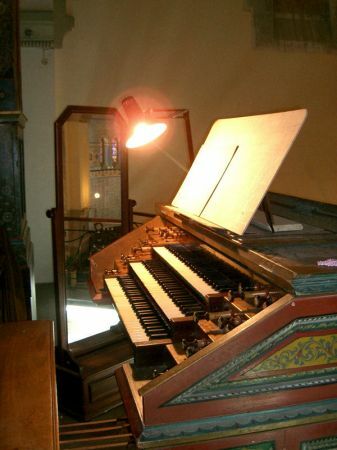 The organ positiv (Cadireta) hides a regal-like Saboiana, together with other typical stops like Nasards or Corneta, Flautat tapad (actually a RohrFloete) and some aliquotes - Dinovena and Siurell. There are some stops like the Bordo which were used for the first time in the Mallorcan organbuilding tradition.